OK, let's say that I just finished some cool new EEG experiment where I recorded my EEG response to watching cat videos while listening to the Pink Panther at half speed. My next step would be to take a quick look at the data to get the overall big picture. My favorite way of getting that overall view is to make a spectrogram (see example below). My love for these oh-so-colorful plots runs deep. The question is, how does one make spectrograms? Well, in my opinion, if you don't have Matlab (and are afraid of Python), the next best way to make spectrograms is to use one of the multitude of audio editing software packages out there. 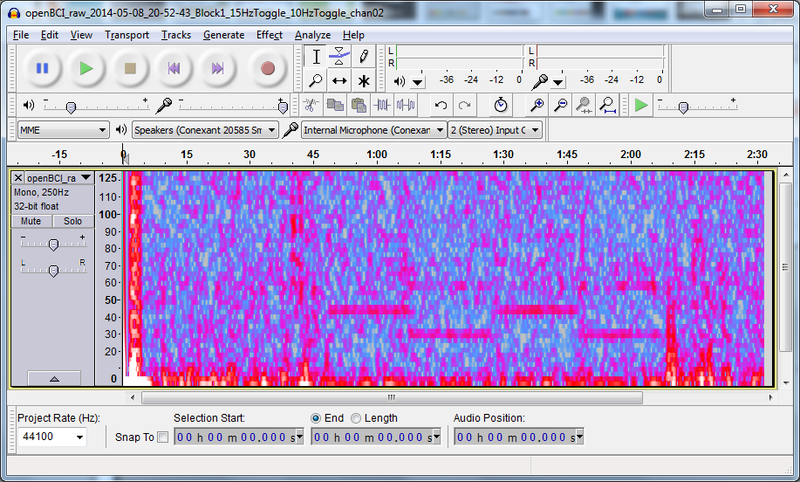 Many audio edit programs provide a spectrogram view. 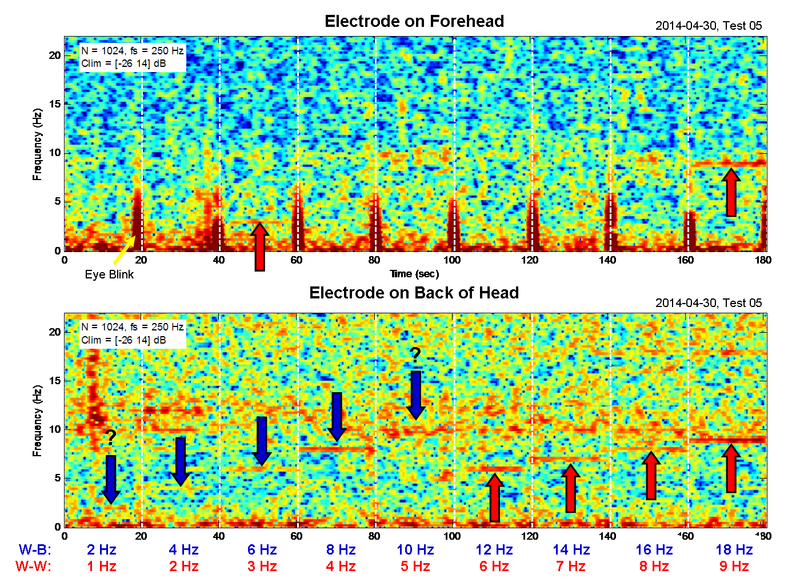 This post is about getting EEG data into an audio program so that you can see your data. entrained with the changing blink rate in the movie. Converting to a WAV File: The first step in using an audio program for EEG analysis is to convert one's EEG data into an audio file. Since I usually work in Windows, I tend to convert all of my EEG data into WAV files. I choose WAV because it is uncompressed. I never choose MP3 because it is very unclear what its "perceptual coding" would do to my precious brainwave data. So, a WAV file is what I would recommend. But how do you get EEG data into a WAV format? If your EEG data is in text format (such as is logged by the OpenBCI GUI), you could use my Processing sketch "ConvertToWAV". This sketch will read in an OpenBCI log file and write each EEG channel out as its own WAV file. You can get the sketch on my GitHub. Audacity: Once the data is in WAV format, you can open it in any audio program. A popular (and free!) audio editing program is Audacity. While it is not my favorite audio editing program, it is perfectly sufficient for working with EEG data. After opening your EEG data, the trick is to figure out how to switch the display from waveform to spectrogram. The screen shot below shows how to do it. Once Audacity is in spectrogram mode, you need to zoom in on the vertical axis in order to see the interesting EEG features, which are usually focused in the lower frequencies. 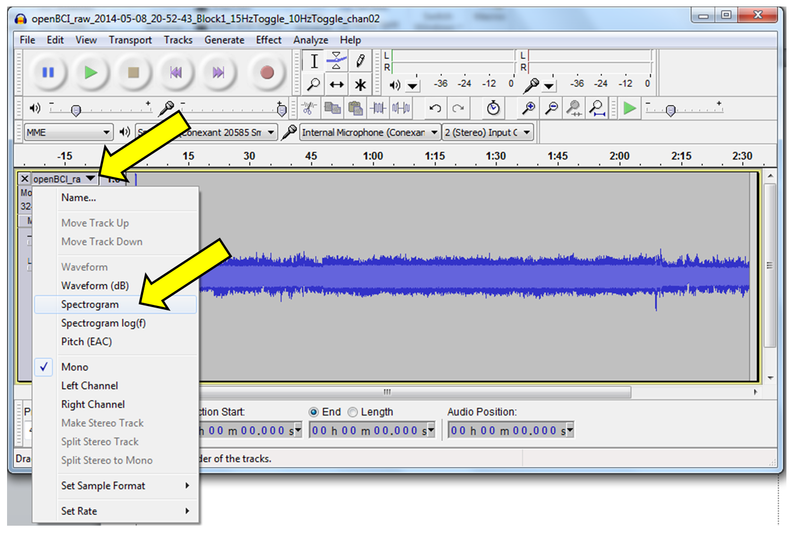 In Audacity, you zoom simply with a click-and-drag on the vertical axis. Then, after manipulating the spectrogram settings under the "Preferences" menu, you can get a spectrogram like the one shown below. While the color scheme hurts the eyes a bit, this spectrogram is good enough to see the same kind of EEG entrainment as seen in my original Matlab plot. Furthermore, the tools in Audacity let you further analyze the EEG data through zooming, filtering, amplifying, and (if you change the file's sample rate to increase the playback speed) you can use Audacity to listen to your own brain waves! 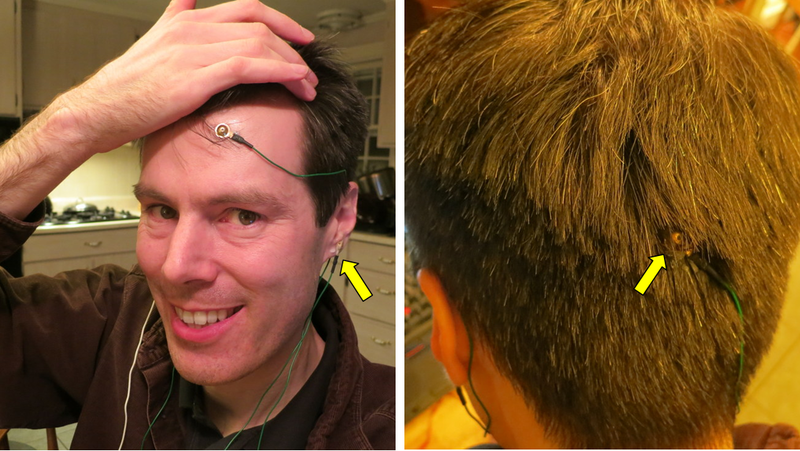 Audacity is definitely a useful tool for working with EEG data. 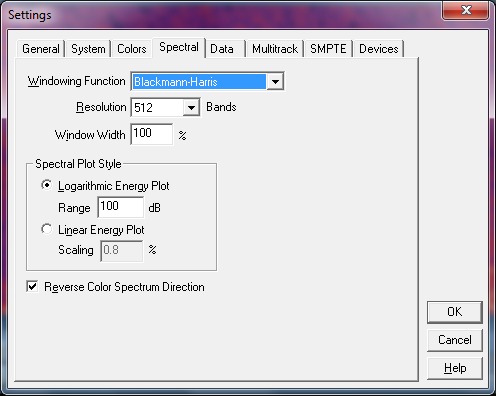 The spectrogram settings that I used are shown in the screen shot below. the Window Size, the Gain, and the Range. Cool Edit Pro: I first started getting into spectrograms in the late 90's because this is when I started working with audio and music on the computer. 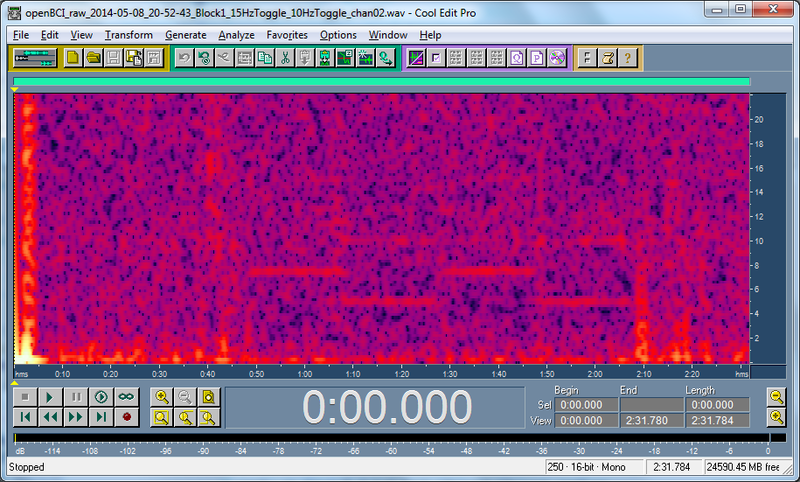 What got me hooked on spectrograms was a piece of shareware called Cool Edit. It was a stupid name for an otherwise outstanding program. It was so useful that I spent the extra dollars and bought its upgrad -- Cool Edit Pro. Cool Edit Pro has a *great* spectrogram display, as shown below. Unlike Audacity, which requires lots of manipulation of the spectrogram settings to get a useful view, the Cool Edit Pro display always seems just right. Unfortunately, Cool Edit Pro isn't available anymore -- it was bought by Adobe in the early 2000s and became Adobe Audition. Audition is also fine for making spectrograms (I have only used up to Audition 3.0), but it is expensive. An EEG Spectrogram in Cool Edit Pro V1.2a. It's an old school program that totally rocks. In Cool Edit Pro, the only display parameter that you need to change is the "Resolution" (ie, FFT size). You do that under the "Settings" menu. My settings for viewing EEG spectrograms in Cool Edit Pro. I changed the Resolution value. 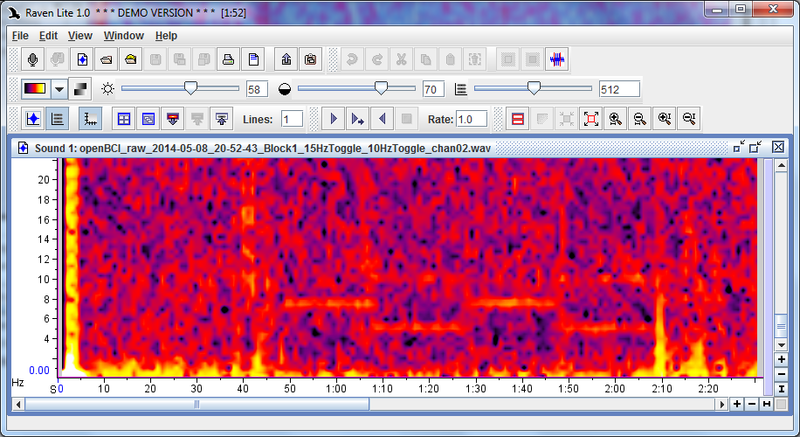 Raven Lite: A third option for making spectrograms is a bit more obscure. A bunch of years ago, I came across a program called "Raven Lite", which is produced by the Ornithology Lab (ie, bird science) at Cornell University. The "Lite" version is free. You can download it and immediately use it for spectrograms, though it is crippled in other ways until you email them for a free (non-commercial) key. What I really like about Raven is that, as shown in the screen shot below, its spectrogram controls are right on the main window for easy manipulation. 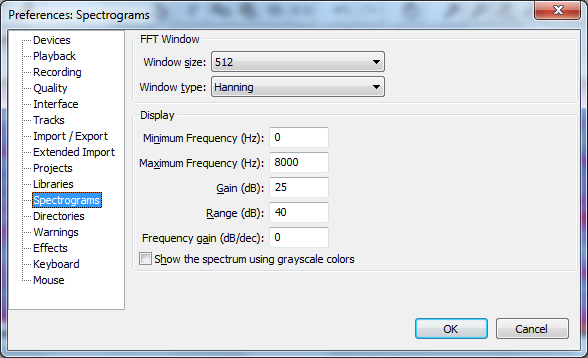 Also, I like its color map options way better than what is available in Audacity. Finally, Raven is one of the few programs that let you see both the spectrogram view and the waveform view at the same time (not shown). It is really nice to have that capability. the display or right here in the main window. Other Options: Because I have Matlab and Cool Edit Pro (and Audacity and Raven) I haven't spent a lot of time looking at other options. Does Garage Band offer a spectrogram view? Is there a plug-in for iTunes or Windows Media Player that gives spectrograms? I'm curious to hear what you folks use. Drop a comment and let me know! In a previous post, I showed that I could induce (entrain) brain waves at different frequencies simply by staring at blinking movies playing on my computer. Having demonstrated this basic feasibility, my goal now is to exploit this phenomenon to make a brain-computer interface (BCI) to control future hacks. My idea is to play two blinking movies simultaneously -- one at a slow speed and one at a fast speed. I'm hoping that my brainwaves will only entrain with the blinking from the one movie that I choose to focus on. Does my brain work this way? Will my brain successfully reject the blinking from the movie that I'm ignoring? Let's find out! Simultaneous Blinking at Two Speeds: Previously, I made some blinking movies where the whole screen would blink black or white at a given speed. To make this idea work for a BCI, I want my screen to blink at two different rates at the same time. So, as you can see in the video above, I made the left side of my screen blink at one rate while the right side of my screen blinks at a different rate. I'm hoping that, if I focus my attention on the left side of my screen, by brainwaves will only become entrained at the left-side blink frequency, whereas if I were to focus on the right side of the screen, my brainwaves would follow the right-side blink frequency. Swapping Sides: To help with this test, I wanted to remove any effect of turning my head to change my gaze between the two sides of my screen. So, in creating my dual-rate blinking movie, I had the movie automatically swap sides every 20 seconds. As a result, it starts with fast blinking on the left and slow blinking on the right. After 20 seconds, it swaps so that slow is on the left and fast is on the right. It does this swap a few times. The Matlab code that I used to make these movies is here. I created a movie where the left and right sides blink independently -- left is fast and right is slow. For this test, the two blink rates swapped sides every 20 seconds. Choosing my Blink Rates: Based on my previous results, it looks like my brain (coupled with my computer's limited ability to blink steadily) is most easily entrained in the 6-10 Hz frequency range. So, for this dual-rate movie, I chose "slow" to toggle between black and white at 10 Hz (ie, a 5 Hz white-white rate) and "fast" to toggle at 15 Hz (ie, a 7.5 Hz white-white rate). In truth, I made a bunch of movies at different rates, but the the 10/15Hz movie worked the best, so I'll only show its results. EEG Setup: With my movies prepared, I gathered up my EEG stuff. Like usual, I used my OpenBCI board and a few cup electrodes with Ten20 paste. I put one electrode on the left side of my forehead (Fp1), on one the left side of the back of my head (O1) and one on the right side of the back of my head (O2). Using the impedance measuring feature, my impedances were 11 kOhm, 67 kOhm, and 28 kOhm (I seem to have an on-going problem getting a low impedance at O1). My reference electrode was on my left ear lobe and my bias electrode was on my right ear lobe. 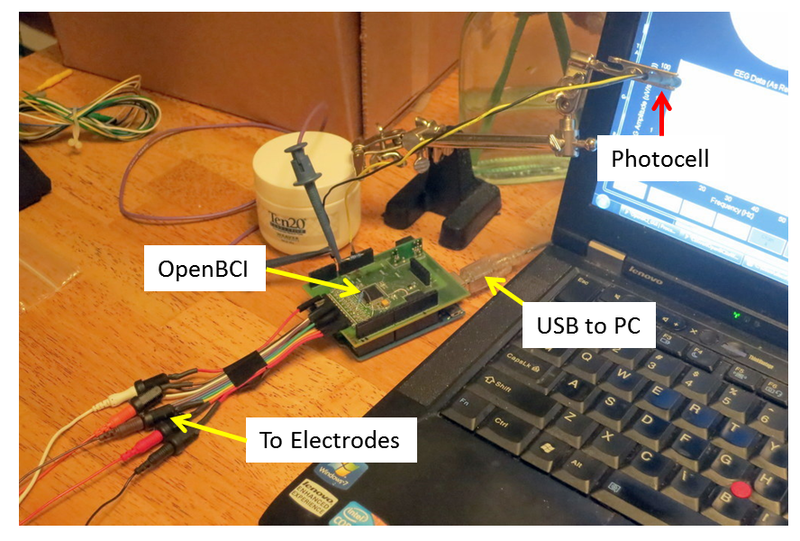 My OpenBCI board was connected to the PC via USB and I was logging data using my OpenBCI GUI in Processing. For this test, I also used my photocell to confirm that my computer's blinking was sufficiently steady. photocell to confirm that the screen was blinking at the right rate. Results: After setting everything up, I started recording my EEG data and then I started playing the dual-rate blinking movie. It was night time, so my room was pretty dark. I focused my attention at the center of the left-hand movie. As described above, the left movie toggled fast-slow-fast-slow every 20 seconds, while the right movie played the opposite -- slow-fast-slow-fast. 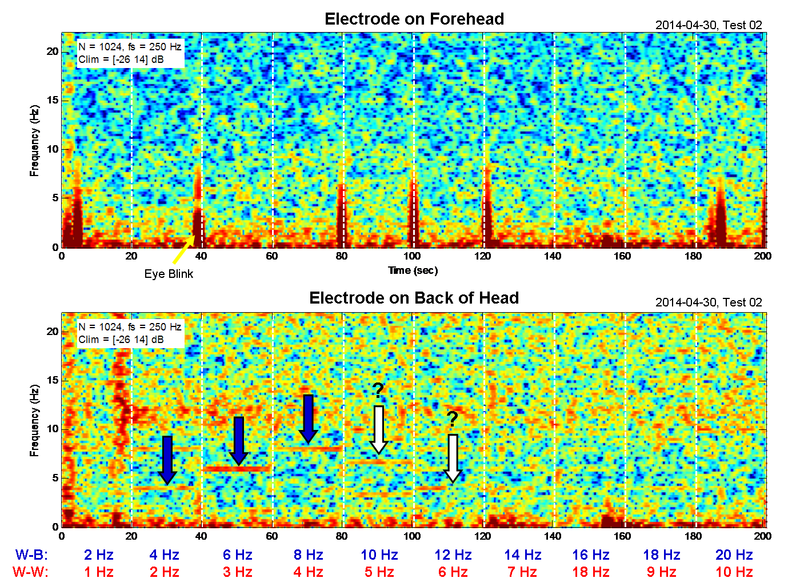 Spectrograms of the EEG signals from my head are shown in the figure below. As you can see, there was no entrainment seen in the signals from my forehead (as expected) but there was entrainment in the back of my head (also as expected). The best entrainment was seen on the left side of my head. of my head exhibited the strongest entrainment to the blinking of my movie. Only Seeing the Left Blink Rate: Because the left-back of my head (O1) gave the best entrainment, let's just focus on its results. The figure below shows just the results for the left-back of my head. Note how,once the movie starts playing, my EEG signals seem to toggle between a fast blink rate (~7.5 Hz) and a slow link rate (~5 Hz). This exactly follows the white-white blink rate of the left movie. So, my brainwaves successfully entrained to the movie that I was watching. 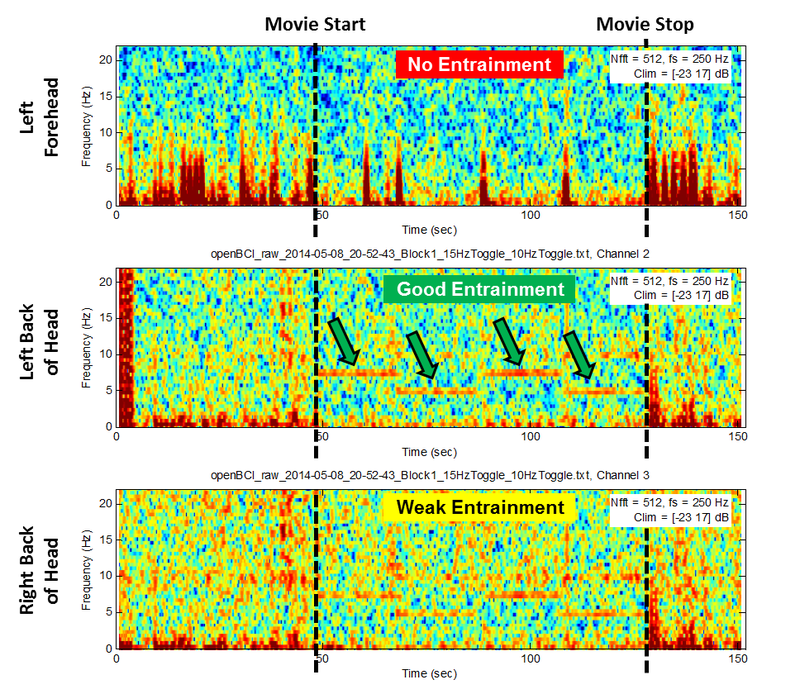 Most importantly, there seems to be no signature in my EEG data from the blinking of the right movie. This is success! appear to have entrained only with the left movie's blink rate. Purposely Shifting My Attention: OK,so I've demonstrated that my mind can successfully ignore one of the movies. That's really good. But, maybe I'm just biased to looking left. To really make this work for a BCI, I need to be able to shift my attention to either movie and have my brainwaves follow. So, for my 2nd test, I started the same movie playing back. But, this time, when the movies swapped sides every 20 seconds, I switched my attention to follow the movie that blinked faster. This means that I started by watching the left movie, then I watched the right, then left, then right. My EEG response is shown below. Note that I showed strong entrainment and,most importantly, that my brainwaves only show the fast blink rate (7.5 Hz). So, by shifting my attention to follow the faster movie, I successfully rejected the effect of the slower blinking movie. Success again! that blinked faster. Because of this focus, my brainwaves remained entrained only at the faster rate. All the Elements are In Place: It looks like I now have the elements in place for a 3-state BCI. If I don't look at the movie at all, I get State 1: "Nothing". If I watch the blinking of the left movie, I get State 2: "Left". If I watch the blinking of the right movie, I get State 3: "Right". It may be possible to further divide my screen to get more blinking regions to add more BCI states. Maybe that's a good experiment for the future. Right now, though, I think that I'm going to turn my attention to a little robot that I got (thanks for the pointer Conor!) to see if I can control it with visual entrainment. This is gonna be fun! Follow-Up: I successfully used visual entrainment to control a six-legged robot! In my previous post, I used blinking videos on my computer to entrain my brain waves. A key question, though, was whether my computer could play those blinking videos steadily. If the blinking isn't steady, it won't entrain brainwaves that are easily detected. So, in this new post, I show how I hacked a photocell and my Arduino to measure the blink rate that my computer is actually producing. It's a pretty simple (and cheap!) setup and, as you'll see below, its data explains some of the important findings in my EEG data! Using a Photocell: My approach to measuring the video blink rate is to quickly and continuously measure the light produced by my computer screen. I chose to use a photocell, mostly because I had one that came with my very first Arduino. 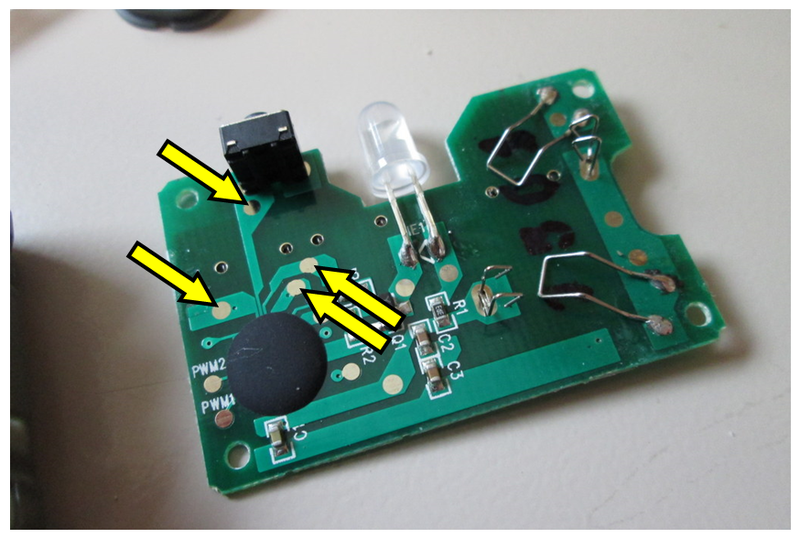 To learn how to use a photocell, I followed the tutorial at Adafruit. It explains what a photocell is and it explains exactly how to hook it up to an Arduino. The key is that you connect a photocell and a 10K resistor in series. Together, they form a voltage divider. Then, you connect one end to +5V and the other end to ground. In the middle, at the junction between the photocell and the 10K resistor, you connect that point to the Arduino's analog input pin. Pretty easy! Wiring It Up: To connect all of the bits together, I needed to solder a few things. First, I gathered my components -- the photocell, some wire, and some shrink tube (to keep the soldered wires from shorting to each other). and some Shrink Tube. The 10K resistor is not shown. Then, I soldered the wires to the legs of the photocell and insulated them with the shink tube. The photo below shows the components after this assembly. Looks decent enough. and sides of the photocell are exposed. This turned out to be bad. Unfortunately, when I hooked it up to my Arduino, I found that I was not seeing any change in the light level from my computer screen. After some playing around, I found that the photocell is sensitive to light from the back and sides, in addition to being sensitive to light from the front. So, as seen in the photo below, I added another layer of shrink tube to block out the light entering from the back and sides. back of the photocell. You have to keep out that light! Mounting Everything: Once I had my photocell on those long(ish) lead wires, I connected it to the Arduino as discussed on the Adafruit site. I then needed a way to hold the photocell close to the computer screen so that I could measure its blink rate. As shown in the photo below, I found that my adjustable soldering fixture (sometimes called a "3rd Hand" fixture) works really well. It works best if you position the photocell to be VERY close to the computer screen. 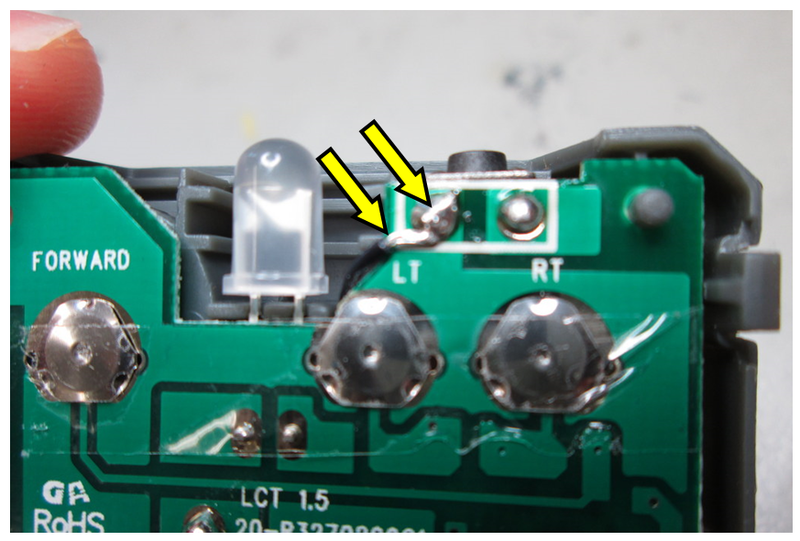 I held the photocell to the computer screen using a"3rd Hand" soldering fixture. 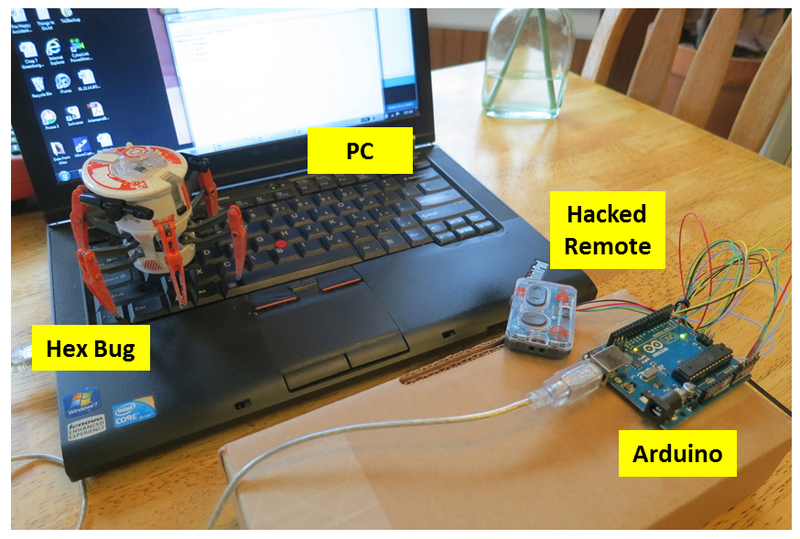 Arduino that is the host for m OpenBCI shield. Position the photocell to be VERY close to the screen. Integrate with OpenBCI: The OpenBCI shield generates data packets at a very precise rate (I usually configure mine to sample at 250 Hz). It could act as the clock to drive the Arduino to sample the photocell steadily. 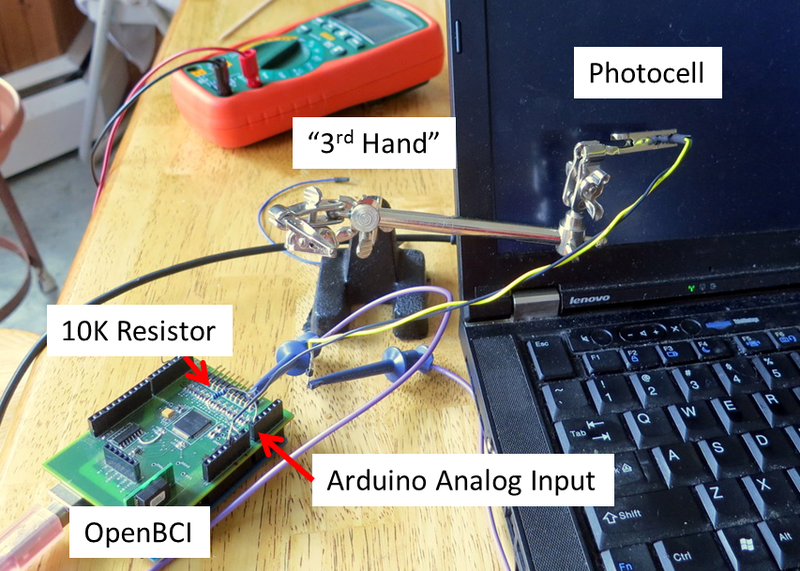 So, I modified the OpenBCI Arduino sketch to read one of the analog input pins every time that it receives data from the OpenBCI shield. It then appends this extra data value to the OpenBCI data packet and sends it to the PC. Finally, I modified my OpenBCI GUI to receive the extra data and to include it in its log file. has a different blink rate -- from a 1 Hz white-to-white blink rate up to a 10 Hz w-w rate. Zooming-In: Excerpts from three of the movies are shown below. In these plots, you can see that the light pulses recorded during the 3 Hz and 10 Hz movies look to be steadily paced, whereas the pulses in the 7 Hz movie looks much more irregular. Based on this qualitative view, I'd say that the irregularity of the 7Hz movie might cause complications when used for EEG experiments. see 4 periods, despite their increasing speed. Measuring the Blink Rate: To better assess the steadiness of each movie, I setup a routine to quantify the blink rate on a blink-by-blink basis. I did this by, first, computing the mean sensor value for the whole recording. This is my threshold for deciding whether the screen is "white" or "black". This threshold value is shown by the horizontal black line in the excerpts above. Then, I detected when the signal crossed this threshold. Each threshold crossing is shown as a blue dot in the figures above. To compute the blink rate, I compute the difference between the dots. The "white-to-white" blink rate is the difference between the red dots. Alternatively, the rate at which the screen merely changed (either from white-to-black or black-to-white), I measured the difference between the blue dots. Blink Rate Throughout the Test: The plot below shows the results of quantifying the blink rate throughout the test. 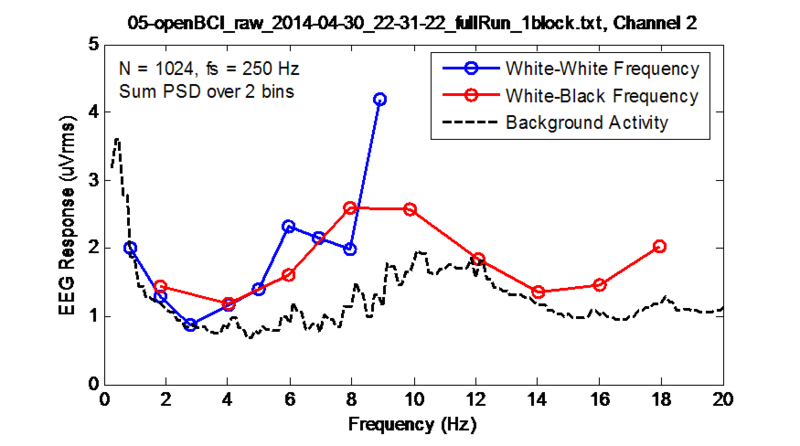 In red, the plot shows the white-to-white blink rate. In blue, I show the blink rate from both transitions. As expected, the blink rate counting both transitions is twice as fast as the blink rate when counting just from white-to-white. counting both transitions (whit-to-black and black-to-white) is especially unsteady at the higher speeds. Unsteadiness: As can be seen in the plot above, the blink rate is pretty steady for the first four movies (ie, speeds of 1-4 Hz W-W). For the 5th movie (5 Hz W-W), the plot above starts to look messier, especially the blue line. This means that the system is not playing back the blinking movie smoothly. As we get into the faster movies (6-9) Hz, the blue line gets extremely messy. Clearly, the system is unable to keep a steady pace of white-to-black and black-to-white transitions (the blue line), though the white-to-white period (the red line) isn't too as bad. Funnily, at 10 Hz, note that the white-to-white blink rate gets very stable again. It seems that at 10 Hz, the individual movie frames must be well-aligned with the natural update rate of the video system on my computer. Relationship to EEG Data: The whole purpose of this investigation was to see if my EEG results from my previous post (copied again below, for convenience) were reflecting properties of my brain, or if they were reflecting artifacts from imperfections in my computer's movie playback. My main question with my EEG data is why I exhibited no video-entrained EEG signals above 10 Hz. Well, looking at the graph of the computer's blink rate (above), we see that the video blink rate becomes extremely unstable for any frequency above 10 Hz. My computer, in other words, was unable to generate steady visual stimulation above 10 Hz. Without stable stimulation, my brain had nothing to entrain with. Therefore, these limitations in my video system mean that I cannot declare either way whether my brain can entrain with visual stimuli at speeds greater than 10 Hz. With a more stable video system, maybe I could entrain with the faster blinks. periods when my brain entrained with the video on every transition of white-to-black and black-to-white. Next Steps: With this system, I have proven that I can assess the steadiness of my video playback system. Steady playback is critical to inducing visual entrainment of brainwaves. So, as I move forward with trying to create a BCI based on visual entrainment, I can use this synchronized photocell recording to confirm that the video stimulation is sufficient to (hopefully) induce EEG responses. Let the development of the visual BCI begin!